As an Exchange Visitor on a J-1 Visa, you are considered a “non-resident alien” for tax purposes. Depending on how long you work and how much money you make, you may be eligible for a refund of much of the taxes you pay. Be sure to file a tax return to get this money back! Remember: InterExchange staff are not tax professionals. If you have tax questions, please consult a tax professional. For tax purposes, you are required to fill out a W-4 Employee Withholding Allowance Certificate as soon as you start working. Your employer will give you a W-4 Form, and it is your responsibility to complete and submit it to your employer. Based on the information you provide on the W-4 Form, your employer will calculate the amount of federal, state and local taxes to be withheld from your paycheck. U.S. law requires that you pay Federal, State and Local Taxes. Your employer will deduct money from your paycheck every pay period. As an income-earning individual, you will be taxed on income from salaries, wages and tips. Your employer will submit the amount withheld directly to the federal government. Deductions for state and local taxes will vary. Some states do not have a personal income tax; others may tax income as much as 8%. Similarly, local taxes will vary but will be significantly less. Note: You will only be paying income taxes. You do not have to pay Federal Social Security Taxes, Medicare or Federal Unemployment Tax (Please note: some states may deduct state unemployment taxes, which you are required to pay). If your employer has withheld these taxes from your paycheck, please advise him or her of the mistake and request a refund. To verify that the proper taxes are being withheld from your paycheck, you should review your pay stub (the paper with your wage details that comes with your check). If you see deductions that say FICA, FUTA, S.S. or Social Security, please notify your employer promptly. If your employer is unable to issue a refund, contact the Internal Revenue Service Center and request IRS form 843 “Claim for Refund and Request for Abatement”. You will need to submit the completed IRS forms to the Internal Revenue Service Center. Please follow the instructions in this handbook. Your employer may tell you to follow the instructions printed on the form, but this is not correct. The instructions on the W-4 Form are for U.S. residents. They are not for you. Mark or check “Single” on line 3. Write “NRA” or “Non-Resident Alien” on line 6. There should be no additional withholdings on this line. Do not claim “exempt” on line 7. Line 7 should be left blank. You are not exempt just because you are a student in your home country or because you make less than a certain amount of money. Please do not claim exempt. Can I get back the taxes that were taken out of my paycheck? You may be able to get a refund for some, or even most of the money you paid. Your refund depends on how much money you made while you were in the U.S. It also depends on how you filled out your W-4. If you fill out your W-4 according to our instructions, you should not owe the government any money. You also may be able to get money back. If I may be eligible for a refund later, why do I have to pay taxes at all? If you don’t pay taxes, you are breaking the law. If you owe the government money at the end of your stay, you may not be able to return to the U.S. in the future. Filling out your W-4 Form properly will ensure that you do not owe the U.S. government any money. The taxes will be taken out of each paycheck. If you have paid too much in taxes, you can get it back by filing a tax return once you have returned home. All individuals who have earned income in the U.S. are required to file a tax return for the year they earned wages. When preparing your tax return, it should show your earnings for the year wages were earned, the taxes you paid and the total amount of taxes owed or refunded. To file for your tax return you will need your W-2 and Form 1040NR-EZ. At the beginning of the year, your employer will send you a W-2 Form. Your employer is required by law to mail your W-2 to you by February 15th of the year following your camp assignment. Please give your employer your home country address. If you don’t do so, your employer will not be able to send you the necessary forms to file for your tax return. Before leaving your job, give your employer a self-addressed envelope so that he or she can mail you your W-2. This form summarizes your earnings and taxes withheld from you the previous year. A W-2 usually has four copies: federal copy, state copy, local/city copy and employee copy. 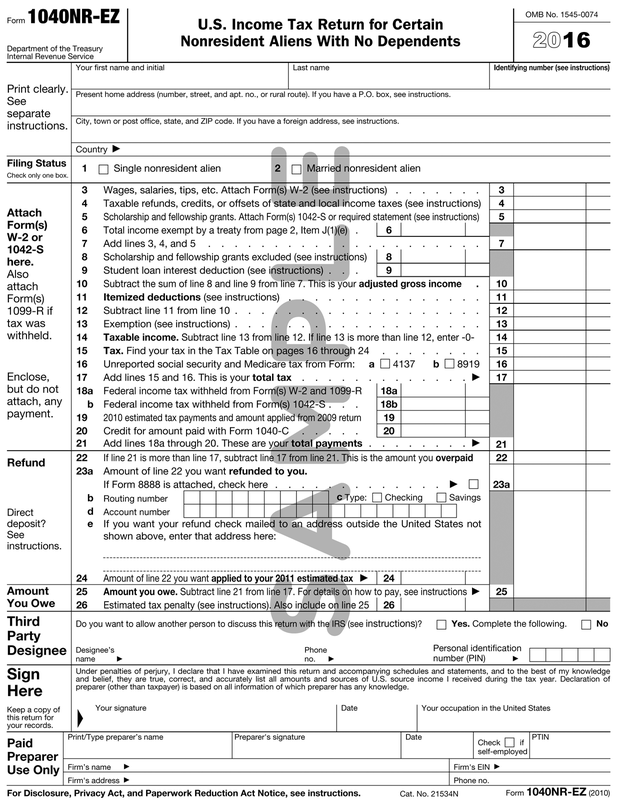 Upon receiving your W-2 Form, you will fill out a 1040NR-EZ (Non-Resident Aliens with No Dependents) tax form. You can obtain this form at the United States Embassy in your home country or on the Internet at www.irs.gov. When you request the 1040NR-EZ Form, make sure to ask for the instructions pamphlet. To avoid any mistakes, follow the instructions carefully. If you overpaid the government, they will issue you a check. However, if you did not pay enough taxes, you must pay the government the amount you still owe. You must file your taxes before April 15th of the year following your camp assignment. 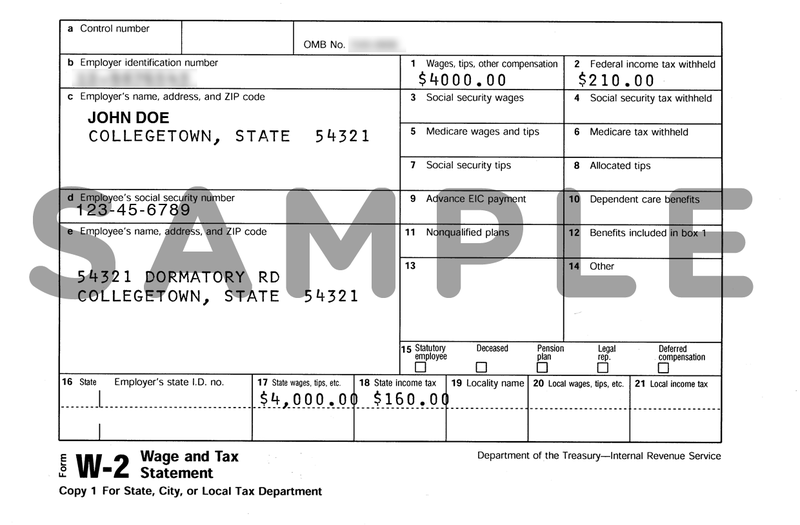 Please look at the sample 1040NR-EZ Form. There are separate forms for state and local taxes. You must request these state and local forms from your employer. They are not available at the embassy. The U.S. government agency that collects taxes is the Internal Revenue Service. You can get forms, instructions and information from their website: www.irs.gov. If you have difficulties filing your Form 1040NR-EZ, there are many companies that will, for a small fee, file your tax return for you. InterExchange recommends that you use a registered tax preparation service.